If anyone does not believe that Holy Mary is the Mother of God, he is severed from the Godhead. 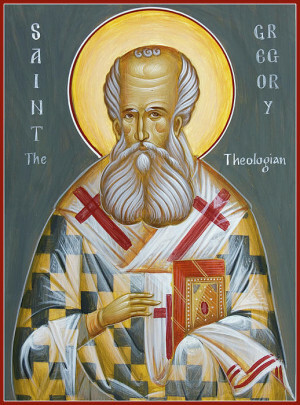 If anyone should assert that He passed through the Virgin as through a channel, and was not at once divinely and humanly formed in her (divinely, because without the intervention of a man; humanly, because in accordance with the laws of gestation), he is in like manner godless. If any assert that the Manhood was formed and afterward was clothed with the Godhead, he too is to be condemned. For this were not a generation of God, but a shirking of generation. If any introduce the notion of Two Sons, one of God the Father, the other of the Mother, and discredits the unity and identity, may he lose his part in the adoption promised to those who believe aright. For God and man are two natures, as also soul and body are; but there are not two Sons or two Gods. For neither in this life are there two manhoods; though Paul speaks in some such language of the inner and outer man. And (if I am to speak concisely) the Savior is made of elements which are distinct from one another (for the invisible is not the same with the visible, nor the timeless with that which is subject to time), yet He is not two Persons. God forbid! For both natures are one by the combination, the Deity being made Man, and the Manhood deified or however one should express it. And I say different elements, because it is the reverse of what is the case in the Trinity; for There we acknowledge different Persons so as not to confound the persons; but not different Elements, for the Three are One and the same in Godhead…. If anyone has put his trust in Him as a Man without a human mind, he is really bereft of mind, and quite unworthy of salvation. For that which He has not assumed He has not healed; but that which is united to His Godhead is also saved. If only half Adam fell, then that which Christ assumes and saves may be half also; but if the whole of his nature fell, it must be united to the whole nature of Him that was begotten, and so be saved as a whole. Let them not, then, begrudge us our complete salvation, or clothe the Savior only with bones and nerves and the portraiture of humanity. For if His Manhood is without soul, even the Arians admit this, that they may attribute His Passion to the Godhead, as that which gives motion to the body is also that which suffers. But if He has a soul, and yet is without a mind, how is He man, for man is not a mindless animal? And this would necessarily involve that while His form and tabernacle was human, His soul should be that of a horse or an ox, or some other of the brute creation. This, then, would be what He saves; and I have been deceived by the Truth, and led to boast of an honor which had been bestowed upon another. But if His Manhood is intellectual and nor without mind, let them cease to be thus really mindless. But, says such a one, the Godhead took the place of the human intellect. How does this touch me? For Godhead joined to flesh alone is not man, nor to soul alone, nor to both apart from intellect, which is the most essential part of man. Keep then the whole man, and mingle Godhead therewith, that you may benefit me in my completeness. But, he asserts, He could not contain two perfect natures. Not if you only look at Him in a bodily fashion. For a bushel measure will not hold two bushels, nor will the space of one body hold two or more bodies. But if you will look at what is mental and incorporeal, remember that I in my one personality can contain soul and reason and mind and the Holy Spirit; and before me this world, by which I mean the system of things visible and invisible, contained Father, Son, and Holy Ghost. For such is the nature of intellectual existences, that they can mingle with one another and with bodies, incorporeally and invisibly.